Mass produced and often crudely manufactured ceramic figures have long jostled for space on tabletops and mantles in homes the length and breadth of Britain. ‘Disfigurines’ are Claire’s manipulated end product of such ceramics. Figures are subverted to satirise and pervert the traditional cloying and romanticized life portrayed in there traditional figures. Victorian idyllic scenes of a by-gone genteel age, where ladies take tea, couples play cards and young lovers steal kisses, are re-appropriated to portray the desperateness and humor of everyday life. They are often angry and sexual depicting a counter reality of drug abuse, sexual perversion, suicide, murder, darkness of mind and other modern malaise. What makes Claire’s work distinct is that the figures have been cleansed for the most part of surface decoration and pattern so they immediately lose the superficiality of charm and appeal. 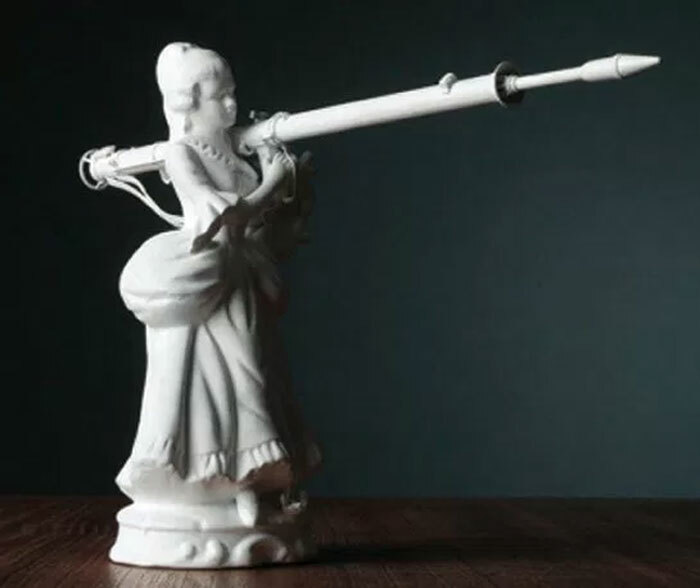 Model poses are re-appropriated and situations re-configured, to construct a new Hogarthian representation of life in porcelain. Claire was born in London and works and plays there too. Studied at Goldsmiths, St Martins and The Royal Academy – graduating at some point. She has worked throughout her career in a variety of mediums and techniques.